Total Score: 8.58 - EDITORS CHOICE AWARD! 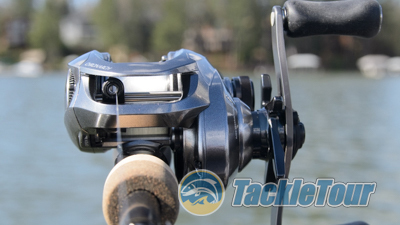 Introduction: If given the choice of just one, low profile baitcasting reel within Shimano's vast lineup to fish, my choice would be rather simple. For me, it's always been about the Chronarch. This product line has forever (well almost forever, let's forget B and E for the moment) defined that fine line between workhorse and flagship, and for me, has served as a litmus test as to whether or not Shimano's R&D department is on their game. Just the same, to say I had high expectations of the Chronarch MGL would be a little off the mark. I didn't expect the this reel to do well. I knew it would. Was this confidence in Shimano warranted? Let's find out. 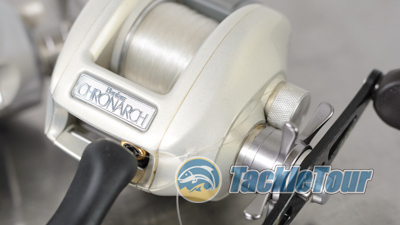 The Chronarch A is one of the reels responsible for my tackle enthusiasm. 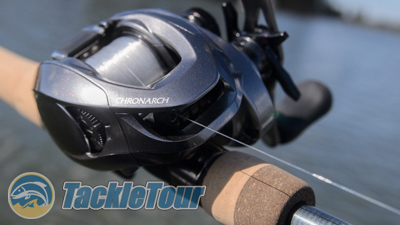 Impressions: The Chronarch MGL is more than just the former Ci4+ with a new spool. 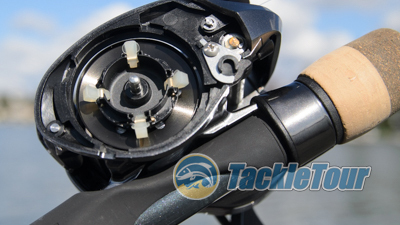 No, Shimano further refined the platform by finally trickling down their micro-module gearing to this reel. The reel's fit is, as far as I can discern, identical to the previous generation Ci4+, but its finish is a darker, more high end, charcoal grey, with very subtle and well dispersed metallic red flakes. Shimano doesn't really specify but comparing the reel's frame and sideplates to the previous generation reel, the carbon composite is similar to the Ci4+, possibly more rigid but hard to tell. One thing that is clear is it is basically constructed out of a carbon composite material. Real World Tests: I wasted little time in spooling my Chronarch MGL up with twelve pound (12lb) Seaguar Tatsu fluorocarbon and mounting it on my newly acquired, current generation G.Loomis MBR842C GLX to put the reel through the paces. Casting: First bait to have the honor of being tied to the end of this new classic combo? Megabass's Vision OneTen. This half ounce rip/jerkbait is a legend in its own right, so it was only fitting to task this bait with the duty of breaking in my new combo. Well, that plus it really was ripbait season. 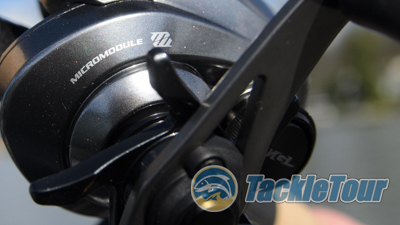 If you've yet to sample any Shimano reel with the designation "MGL," you're missing out. 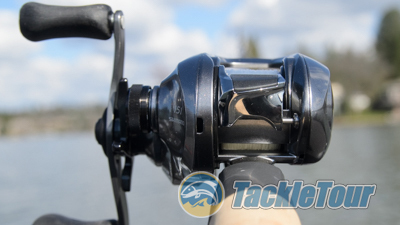 If you've yet to sample any Shimano reel with the designation "MGL", you're missing out. I was all in when the manufacturer debuted their SVS Infinity braking system but when you combine the refinements they've made in those brakes together with the new magnumlite spool, the results are phenomenal. We're talking DC like performance in ease of casting only with better low speed performance in pitching and casting lighter lures. I experienced it with the Casitas MGL and the yet to be written up Metanium MGL, so this is how I knew the Chronarch MGL would be a top performing reel. 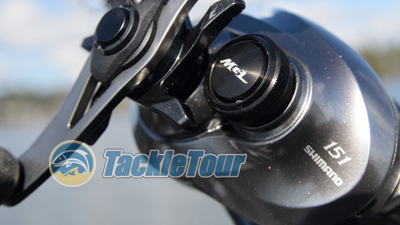 Shimano's latest SVS Infinity braking system coupled with the MGL spool. Retrieve: How do you make an already very good reel better? Well, if you're Shimano, you build it with micro-module gearing - smaller teeth, more consistent contact between gears, equals even smoother, silkier performance. Combine this with the use of brass and not aluminum for the reel's guts and you have a combination that can endure some serious abuse. Even the simplest thing, like that thumb bar - nicely done. Power: There are three retrieve ratios in this reel and though I only tested the 6.2:1, my previous experience with the 7.6:1 Chronarch Ci4+ gives me confidence the now micro-gear enabled Chronarch MGL performs the same, if not better its predecessor (or at least officially micro-gear enabled). Shimano's use of oversized gearing only helps to reinforce this confidence - those larger gears give you more leverage when cranking that oversized 90mm handle. It's official - micro module gears make their way into the Chronarch. Next Section: A drag that you can count on?